Hello my lovelies! How are you all doing? I’m not back quite yet but I did want to share a recipe or two before their season ends. The one problem with trying to write a seasonal blog is that you can’t really take time off! You enjoy the seasonal fruits and vegetables, and cook and bake with them, but unfortunately you can’t sit on your posts because then the season is done. I made the Blood Orange Upside Down Cake for my Super Bowl dessert and that was at the beginning of the month. The blood oranges are in season right now and in plentiful supply at the moment. I thought I’d better share my recipes before they’re all gone! This cake is a cross between an upside down cake and a polenta cake. I was also trying to make it an olive oil cake but my olive oil is pretty strong so I opted for part butter and part avocado oil (which is very neutral tasting). I didn’t want the oil to overwhelm the subtle orange notes of the cake. This cake is quite wonderful, if I do say so myself. It’s moist, with just a little texture from the corn meal and the beautiful blood oranges on top are gorgeously candied and sweet. It didn’t last very long at home. I do hope you try it while the blood oranges are available. Not only is it a beautiful cake, thanks to the vibrant oranges, but it is incredibly delicious too. Caramelised and candied blood oranges top this moist upside down cake. In a 10" round cake tin preferably, place the butter and sugar. Place in the oven to allow the butter to melt, about 5-10 minutes. Remove from the oven and arrange the sliced oranges into the melted butter and sugar. The orange slices will shrink so you can slightly overlap them to get better coverage on top of the cake. I only used one orange so mine are spaced out quite a bit. Keep aside and make the cake batter. Mix the flour, corn meal, salt and baking powder together in a bowl and keep aside. In a mixer bowl or with a hand mixer, beat the butter, oil and sugar together until light and fluffy. Add the eggs one at a time, mixing after each addition. Add half the flour mixture and mix gently. Add the blood orange juice. Add the remaining flour and mix until well incorporated. Spread the batter into the cake pan, carefully. Bake for 45-55 minutes, until toothpick comes out clean and the cake is golden and puffy. Check the cake at 45 minutes and leave a bit longer if still wet in the centre. Run a knife around the sides of the cake if necessary. Unmould the cake while still warm onto a cake plate and allow to cool completely. Serve as is, or with a dollop of sweetened cream. Make sure to cut the orange slices quite thinly without tearing the insides. The thin slices candy nicely and become soft and sweet and accompany the cake perfectly. So, for all the big plans I had for my time off, I have done nothing. I wanted to build up post reserves, and experiment with new recipes and techniques; I wanted to learn more about food photography and practice more with my camera, and so on. In the two weeks I’ve been away, I have done nothing but shuttle children back and forth from school and various activities, and cook dinner. How can someone be so insanely busy but accomplish absolutely nothing? I’ve also been struggling to visit everyone’s sites. I see your emails and I read them but can’t get over to you to comment. It seems like I spend my entire time in my car with just my iPhone, and with my stubby fingers, commenting on a phone is a challenge. Makes me wonder how I manage a blog at all! So, my dear friends, I haven’t forgotten you, I do read the emails that come in but I may not be able to get over to you for every post. I hope you are well, and judging by the lovely emails that grace my inbox, you’re all cooking and baking up a delicious storm. I have one other blood orange recipe to share and then we’ll move on from that to something else. I found this very cool seasonal food chart on this site; shows all the fruit and vegetables in season now in the Northern Hemi. Oh, what a cute photos!! Last year I also prepared a cornmeal and blood orange upside-down cake, it was delicious. Yours has and amazing look!! absolutely decadent & lush. WOWWWWWWW. Oh Nazneen…..that is a stunning cake! I love blood oranges and maybe I love them because I know how limited they are and how little time I have to spend with them! The colors are always so amazing. I love that this cake is made with cornmeal. It looks so moist and those sweet orange tones sound like heaven! And I’m sorry your time off was so busy. I know that feeling. My best laid plans for a day off from work are often thwarted! But so glad you had time to share this wonderful post! Thank you Anne! I think thats the same reason why I love them! We have to scramble to get them while they’re around and think about making fun things with them. The cake trend really well and was very moist. Thanks for your lovely comment! This cake is beautiful and great for using up all the blood oranges crowding the markets! Your cake is a real beauty. I’ve been looking for blood oranges and Meyer lemons in our market but they haven’t shown up yet. Hopefully they will show up soon as my husband loves upside down cakes and this is a winner. Thank you Karen! This upside down cake turned out really nice and was moist too. The oranges were wonderful , all candied and sweet. Thank you for your comment! Thank you Krista! Thanks for stopping by and for the comment! Nazeen, you’re such an inspiration with all the beautiful food you make. This cake looks amazing! I’m sorry you’re so busy but I’ glad you found the time to come up with this lovely cake. You are so sweet Mireya! I appreciate your encouragement and wonderful words, thank you! Hi Nazneen, what a lovely looking cake – I see you got lucky with the blood oranges too. I bought a load once and they were actually just “orange” inside, lol. I didn’t realise that the blemishing on the skin corresponds to the flesh colour inside!… I think, at least! Oh Charles, your comments always illicit a giggle! So funny. I’ve had some of those normal oranges too, but I don’t think there’s a way to tell the colour inside.I just got lucky! Beautiful! The cornmeal must give it a lovely texture. This is a very lovely cake. Although I cannot get to eat bloog oranges 🙁 I hate it since I was a little kid. I have no idea why!!! may be because of its name. Anyway lovely recipe and mouth watering pictures as usual. I like the chart too. BTW: I have no idea why your name is always Nazeen to me !!! may be because I have a dear sister she is called Niveen 🙂 sorry about that but you are really close to my heart like my sis. This looks absolutely amazing! I love blood oranges- just so vibrant and colourful! Definitely going to give this a go! Your dishes are always so picturesque. Yet another thing that looks so great! Thank you so much Bam! I know what you mean about organization. I think I’m starting to get the hang of it, but it isn’t easy. Nice sometimes though to just clear the head and relax a bit. Hope you are doing that while eating a slice of this cake! If I start eating cake while working, thats the end of it! I’m ready for a nap then!! These look so delicious! The vibrant color has made me fall in love with it …. Looking forward to bake this soon..
Well, I usually plan a lot of things which I think is possible and end up doing just few.. and finally cannot really figure out how the time flew so quickly! I’ve always had a soft spot for upside down cakes. It was the first one I ever baked. I used a boxed mix and it just can’t be compared to this cake that you’re prepared, Nazneen. Your use of blood oranges made such a beautiful cake and what a nice change from the standard pineapple slices. I’m surprised to see this post, Nazneen. You’re on a break! I am glad to see it, though. As you know, I, too, am struggling, trying to balance blogging with everything else. As much as I enjoy blogging, it really is taking up an inordinate amount of my time. I think John, Kitchen Riffs, has the right idea. I need to set up a schedule and stick to it. Well, that’s my new plan. 🙂 Enjoy the rest of your time off. I’ll be waiting here for you. Thanks John! Yeah, I can’t stay away! I think it’s hearing from all you guys that I miss the most! Even though I chat with many of you, it’s nice to hear from everyone. But, blogging is hard work! Thank you Taruna! Yes, avocado oil is wonderful, very healthy and you can sue high heat. Much better than canola or vegetable oil. Hope you can find it. Nazneen I missed you a lot! welcome back… with this amazing cake…I’m sure it was delicious! Thanks Monica! Yes, I like using oil in cakes too, they really do stay moist. I love the idea of doing this with blood oranges—I just got some blood orange shampoo and must continue on with this recent theme!! Denise Browning@From Brazil To You recently posted..Escondidinho de Frango (Brazilian Chicken Shepherd’s Pie)… A Super Delicious One Dish Wonders!!! Denise, you are welcome anytime!!! This looks absolutely stunning. I bet it’s delicious. This looks amazing! I’m a big fan of upside-down cakes. I made a kumquat one, and and star fruit one (posted on my blog). I just love how striking the blood orange is. I may have to make it! Marni | Love and Duck Fat recently posted..How to use stale bread + 24 stale bread recipes! Star fruit sounds amazing! I’ll be over to check out your cakes :). Thanks for stopping by Marni! Managing time can be tough! I have more time than most, but I have problems with it, too. The only way to get stuff done is just to schedule it. And sometimes do it in bits and pieces. It goes slower and isn’t as satisfying, but eventually things to get done. Hard to do, though, I know so well! Anyway, this cake is gorgeous! I love it! Thanks. I always thought of myself as organised but lately, I’m really wondering if that’s true! Time just slips through my fingers and I’m so tired at the end of the day, I fall asleep on the sofa watching telly. Sad. Thanks John! I will have to follow your tips! I do too. I adore citrus generally but love it in baked treats. Thanks Francesca! Nazneen – how wonderful to receive a “bonus” post from you! I think this cake is such a great combinations of flavors and textures! I have never tried avocado oil – do you generally use it in pace of canola oil? Is it healthier? Thanks David! Feels good to be back even if it’s for a few. I have replaced canola with avocado totally. Once I started going GMO free, I couldn’t use canola. Even organic canola is a bit dicey purely because of how it was created and from what. Avocado oil has higher omega 3 fats which are better for me as someone who struggles from inflammation. If I need to deep fry, I try and find a GMO free sunflower as it’s less expensive than avocado. But avocado oil is def healthy. Me too! I loved the colour of this cake plus the colour of the oranges. Thanks Balvinder! Me too! I was really happy with the sunny colours of this cake. Thanks Balvinder! We are in.the.same.boat. I absolutely cannot type on the phone – if nothing else, the auto correct drives me nuts. In fact, did you know my blog does not even operate well on the mobile? It is a bug no one seems to be able to fix. So I can’t even visit my own blog. I cooked for 11 families yesterday, and 4 in the last, and did not click a single picture, even when the party was on. It’s just one of those things I simply am not develop a habit of. I vanish even when I make staunch resolution NOT to do it. Sigh!! I so hear ya girlfriend! Rant over. Now I need that bloody great piece of cake. Now if only I could bake like you…and btw you could give photography lessons. You don’t need them. So, is this the party I saw photos of you knocking back a few shots ;)? Looked like a good time!! 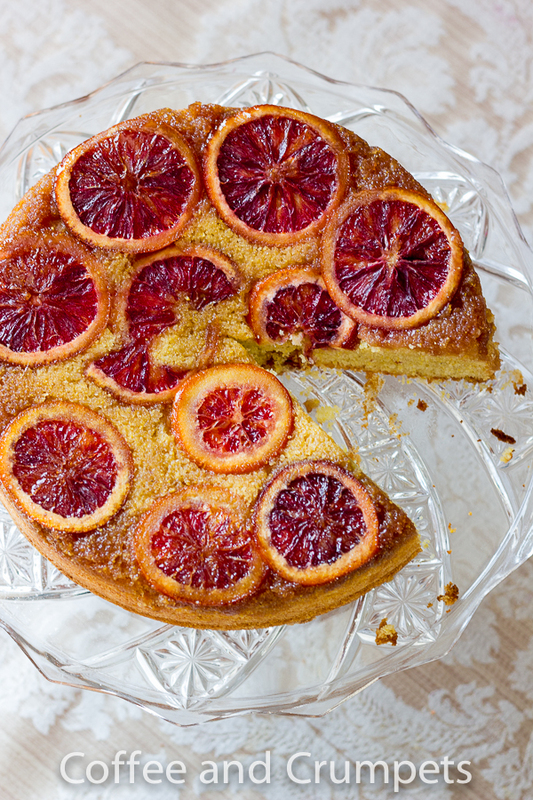 ‘Tis the season for blood oranges, and this cake looks utterly tempting. I love this fruit and I simply am wild about polenta. I’m going to try this. Thanks! Thank you so much, Adria! Blood oranges are quite striking! Thank you for stopping by. Blood oranges have an exquisite flavour! Thank you, Uru my dear. It was quite delicious too! Wow, she is a stunner daaaaaahling. I attempted to make a pie today, a key lime pie to go with my last post. Epic fail. Makes me appreciate the beauty of this one even more. This is gorgeous Nazneen, mA! I just bought some cornmeal yesterday because I was planning on making a strawberry and corneal cake; this looks like a wonderful way to use some of the rest up! I’ve never eaten blood oranges but I’ve been tempted to; the color is just gorgeous! Thank you, Henna! Blood oranges actually don’t taste very much different to regular oranges, but its their colour thats amazing subhanAllah. In fact, some can be down right tart! But I love them regardless, they make the best coloured desserts without the need for food colouring! Are you going to post your cake? I hear ya, sometimes I feel like an exhausted whirlwind and have accomplished nothing. And I don’t even have kids. My job is demanding. Nazneen, this cake looks beautiful. I need to make sure I buy more blood oranges before they’re gone. They are just so pretty. Hi Lea Ann! They had a good supply of blood oranges at Whole Foods, Trader Joe’s and Sprouts. Hopefully, you can get your hands on some. The Trader Joe price was really excellent. I agree, they are gorgeous. Oh wow, Nazneen -this cake looks incredible! Thanks for sharing the recipe – wow! Shashi @ RunninSrilankan recently posted..Lentil & Tofu Stew with Roots Hummus! Thank you, Shashi! I love blood oranges because they are naturally beautiful. Looks superb Nazneen. I’ve been doing a lot of long haul lately, so before I go away for five days I like to leave my wife a cake of some description. The two best have an oil based zebra cake and a sachertorte. They both keep moist until it’s gone. I made a lemon cake last week from Raymond Blanc and it was like eating polystyrene. I’ve decided in future to only make oil/ground almond based cakes. I love pan orange and polenta cake. Unfortunately it’s going to have to be normal oranges. David Crichton recently posted..Sunday Roast. Hi David! Thank you! You know, more and more I am liking cakes with oil. They are so much moister than butter cakes. I like to mix the two so I can get that buttery flavour with the moistness of the oil. Your two cakes sound delish, I love sachertorte. Lucky wife 🙂 Are you flying this way anytime soon? Great to see a post from you Nazneen! That too such a glamorous cake! I actually love cornmeal in cakes so I am going to LOVE this cake. The photographs are beautiful! I can imagine your busy life and need for a breather. My already hectic life just got busier. It’s been crazy and I have not been keeping well. But I just can’t convince myself to take a break. Yet! So the result is lack of sleep, back pain and so on. Take care and will look forward to more from your side. Hugs! Sugar et al recently posted..No Bake Caramelised White Chocolate Cheesecake. And a Blog Birthday. Thanks Sonali! I hope you are better. As a mum, you can’t really take a break, can you? Still have to cook and look after the young’uns. Take care of yourself! Beautiful cake! I have a bowl of blood oranges staring me in the face and was just now wondering what non-fussy, not too decadent dessert to make with them. Now I know! Thank you! Nice to hear from you, hope you are keeping well and not too busy!